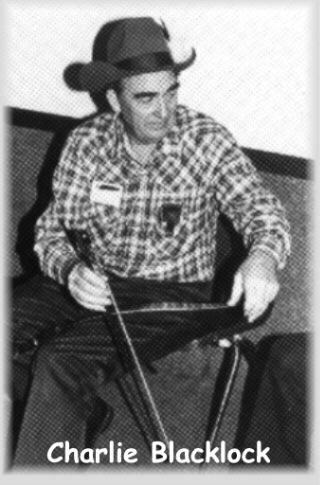 Charlie Blacklock, master sawyer and founder of the International Musical Saw Association was instrumetal, along with his wife Viola, in keeping the association alive and the annual festivals happening for many years. He passed away April 17th, 2008 at the age of 93. He was always an inspiration to those working with him and had a magnetic ability to gather crowds. We miss him and Viola and we thank them for showing us the way. Click below to hear Hajime Sakita playing his composition for Viola Blacklock. The world of musical saw players lost its elder statesman April 17 when Charlie Blacklock of Alameda died at age 91. "He wasn't a big deal, he was THE deal," said the current champion, 20-year-old Caroline McCaskey of San Pablo, who won the title last summer at the annual International Musical Saw Festival at Roaring Camp near Santa Cruz, which Blacklock founded in 1991. "Everybody loved him," she said. "He was so supportive of anybody who wanted to play the saw." Like many younger sawyers – that's the technical term – McCaskey got her first musical saw lesson from Blacklock. "He showed me how to hold the saw, how to hold a bow and how to get a sound out of it. Then he said, 'OK kid, now go home and practice.'" In addition to founding the festival, Blacklock founded the California Saw Players Association – later changed to International Saw Players Association – and served as its first president until failing health forced him to retire in 2002. He had his own band called, simply, Charlie's Band. Over the years, the members included such luminaries as Nina Gerber, Professor Gizmo and professional whistler Jason Serinus, who did the whistling for Snoopy's bird, Woodstock. He also designed, produced and sold his own line of musical saws, the C. Blacklock Special, which come in 28-inch "tenor," 30-inch "baritone" and 36-inch "mini-bass" sizes and are renowned for their beautiful, clear and mellow tone. His wife of 69 years, Viola, who died in 2005, made carrying cases for the saws and kept the books. "She was the brains of the outfit," said Morgan Cowin of San Rafael, who succeeded Blacklock as ISPA president. In 1999 he was inducted into the American Old-Time Country Music Hall of Fame. He had fans all over the world, with a particularly strong fan base in China and Japan. Blacklock was born Feb. 15, 1917 in Hollister. He grew up on the family farm, which his grandfather established shortly after the Civil War. "His dad had him go out and sleep with the turkeys during thunderstorms to keep them from injuring themselves," said his longtime friend, accordion/guitar player Art Peterson of El Cerrito, who performed with Blacklock for tourists for several years at Fisherman's Wharf. "We were just down the street from The Human Jukebox," said Peterson. Blacklock studied clarinet in high school and picked up the harmonica on his own. As a young boy he designed and made a harmonica holder so he could play music while driving the tractor. Then one day he heard a musical saw band called The Crosscut Boys on the radio, and his life changed. "I never heard anything so beautiful before," he recalled years later. "I knew then and there that I wanted to play the saw." The pureness of his sound was legendary, in part because he used his harmonica as a pitch pipe to find the saw's sweet spot. "That sweet spot changes with each note," said Peterson. "If you miss it by an inch, you'll get the note but you'll also get a scratchy bow tone. If you miss it by two inches, you won't get any sound at all." He was adept at many musical styles, but his first love was the popular tunes of his childhood, including "Let Me Call You Sweetheart," "I'm Forever Blowing Bubbles" and "The Missouri Waltz." But music had to be a sideline for many years because his family lost the farm during the Great Depression. He worked as a farm laborer and joined the Fruit Picker's Union, where he became friends with legendary labor organizer Harry Bridges. The two of them were hauled up before a government committee investigating radical influence in the labor movement. Later he took the test for the Electrician's Union and worked as an apprentice electrician at the Oakland Naval Supply Center during World War II. After the war he moved his family to Alameda and joined International Brotherhood of Electrical Workers Local 595. Always seeking to improve his skills, he studied electrical engineering and worked all over the East Bay, often as foreman, until his retirement. He and Viola had three sons – Kenneth, Rodney and Paul – all musicians, as are many of his eight grandchildren and 14 grandchildren. His grandson, Kenny Blacklock, is a noted country fiddler. "He loved to tinker with machines, especially his motorcycle, which he fitted up with a sidecar," said Peterson. "One time he actually traveled all the way to Yosemite with Viola and the kids, all loaded onto that little motorcycle and the sidecar." After retirement, he and Viola traveled all over the country, usually accompanied by two pet monkeys, on whom he doted. "Did I mention that he was also president of the Simian Society?" said Peterson. Blacklock died at Alameda Hospital of complications from a cold. His friends held a memorial service April 25 in Sebastopol, filled with fond stories and much music making. "He was just the sweetest guy," said McCaskey. "He always gave me the feeling that he would have liked me, even if I didn't play the saw." But though he was the world's most famous saw player, he was not the most famous person ever to play the saw. "That distinction belongs to Marlene Dietrich," said Cowin. "But, like many other musicians before and since, she was unable to support herself purely on her musical talent and had to find another line of work." When asked about how he started playing the musical saw Charlie would tell the story of how he'd heard the saw on the radio as a young man, played by a group called "The Crosscut Boys", and that he'd never heard anything so beautiful before and knew then and there that he wanted to play the saw. He had a musical background, having played the clarinet in high school (on an old "Albert System" clarinet) and also played the harmonica. He'd tell how, as a young boy, he'd made a harmonica holder so he could play music while running the tractor on their small farm in Hollister, California, so, naturally, he used his harmonica rack and harmonica to help with finding the melody as well as playing backup to his endeavors on the saw. Charlie eventually became an internationally known sawyer, designing his own line of musical saws available through Elderly Music and Lark In The Morning Music (www.sawplayers.org/links.html); his cd "Old Favorites" and his musical saw instruction video are also available through these outlets. He also founded the Sawplayers Association (www.sawplayers.org). Charlie's grandfather came to California after the civil war, eventually establishing the farm in Hollister. Their main crop when Charlie was growing up was prunes, but they also had a vegetable garden, some turkeys, chickens, ducks and sometimes a cow. Charlie used to tell how his dad had him go out and, basically, sleep with the turkeys during thunderstorms to keep them from injuring themselves. His pet peeve had to do with prunes when manufacturers, for advertising purposes, started calling prunes "dried plums". Ya see, prunes have more sugar in them than plums so a dried prune is good, but a dried plum... well, it just doesn't work. So Charlie'd tell the story, ending with, "a prune's a prune and a plum's a plum." The depression made things tough for the Blacklock family and so young Charlie started working as a picker 'n pruner 'n whatever else he could find and eventually joined the "Fruit Picker's Union" and became involved in union organizing, which at one point landed Charlie in front of a government committee with Harry Bridges at his side. The tough times eventually took the farm from Charlie's family so Charlie studied and took the test for the Electrician's Union and made a career as an electrician. 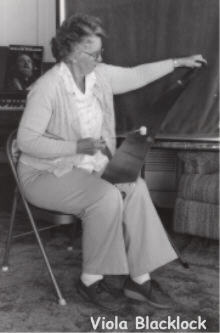 He and his wife Viola, moved to Alameda and raised three boys, Kenneth, Rodney and Paul. For a stretch Charlie worked for Henry Kaiser. He remembered how once Henry's son asked him if he could put in a switch and a light for the swimming pool area that would look like a moon for dark nights. No problem for Charlie, but he sure got a kick out of telling that story. He also told one where they had ordered this special ceiling lamp for Henry's bedroom which took a while to arrive and Charlie could tell Henry was getting impatient. Rather than simply telling Henry when it did arrive Charlie positioned his men with the lamp around a corner, with lookouts to check for Charlie's signal. When Henry asked about the lamp, Charlie raised his hands (the signal) and said, "Well... I don't know, I hope it arrives soon." Turning and glancing out the window, Charlie then exclaimed, "why, I think it's coming right now." Always his own man, and with Viola's support, Charlie led a full life. He was always tinkering with some project in his "workshop" under their modest home and, through the years, working on his motorcycle and cars. The motorcycle had a side-car so once he actually traveled to Yosemite with Viola and his two sons at the time, all loaded onto that motorcycle and side-car. At one stretch, in that little workshop, he helped me make a loft bed; that bed is currently a guest bed in a paraplegic friend's apartment. Charlie eventually started making saw mallets and cutting out vinyl for Viola to make cases for his line of musical saws - the "C. Blacklock Special." While during the last few years he was unable to play the saw anymore, he always had his full range of diatonic harmonicas with him; he had a deep love of family, people and music and will be fondly remembered and missed.